First of all, before you start reading anything else about this kind of photography, read Wikipedia’s entry about Eadweard J. Muybridge, a pioneer of high-speed photography. This will give you a general idea about what high-speed photography is and, most importantly, what are the basics behind it. Even though these pictures look as if they were difficult to take, they are actually really easy to capture, provided you have the right equipment and knowledge. Here is what you will need: a DSLR camera, a speedlight (preferably mid to professional range such as Nikon SB-600, 700, 800 or 900), an off camera TTL Flash Remote Cord (the longer the better), a camera tripod, a remote shutter cord (not necessary but it makes the whole task much easier), a Macro lens (provided you want to get really close, otherwise an ordinary kit lens is also good) some creative ideas and lots of patience. Build-in Flash: ‘–‘ that means that only a brief pre-flash will fire but, due to small aperture and fast shutter speed, this will not affect exposure. If want to completely limit the light coming from your built-in flash get an inexpensive Nikon SG-3 IR panel. Then, switch your speedlight to ‘Remote’ and make sure that the group and channel displayed on your speedlight agree with the settings in your camera’s ‘CMD’ menu. However, if you choose to use your built-in flash in commander mode you will not be able to shoot in High Burst which makes capturing the right moment more difficult. Place your camera on a tripod and compose the picture. You can either choose landscape of portrait orientation, whichever works better for the kind of splash you want to capture. Next, focus your camera on the spot where you will throw your object into the water, which is probably in the middle of your water container. How to do this? Place a long ruler or any flat and long object on top of your water container and right in the middle. Next, put your object in the middle and then focus your camera on it. Once you focus is set, switch your camera to Manual and be careful not to move your tripod or the water container, otherwise you will have to repeat the whole process again. The reason for doing this is that your camera will not be able to focus automatically, as this kind of photography is quite fast. Then, place your speedlight either on the left or right side of your water contained. Do not place your speedlight on your camera or in front of it facing the water container, as you do not want to lit the background of your image. Setting your speedlight in the right position is a creative process and by little experimentation you will be able to achieve different effects. Finally, set your FP (Flash Power) to Manual mode and select either 1/8, 1/16 or 1/32. If you are triggering your flash wirelessly with your camera’s build-in flash, you will need to set these in your cameras “CMD’ menu as explained at the beginning. The FP is largely determined by the aperture you choose and the distance of your speedlight from the object. Remember, you just want to fire enough light to lit the water droplets, but not enough to fill the room with light. Again, creativity and experimentation will get you through. Finally, connect the remote shutter cord and set your camera to High Burst Mode (provided you are using the TTL remote cord). Now it is just one last thing before you can start snapping. This kind of photography requires essentially two things: small aperture and fast shutter speed. The example pictures were shot with 1/200s. shutter speed, f/32 aperture and ISO 1000 (high ISO is not necessary, provided you lit your object well). So, armed with your shutter remote cord in one hand and a small, preferably round, object in the other, stand above your water container, paying attention not to block the light from the strobe. It’s best if you take these pictures in a dark room with a small lamp producing just enough light for you to see the water container, but not enough for the camera to pick it. 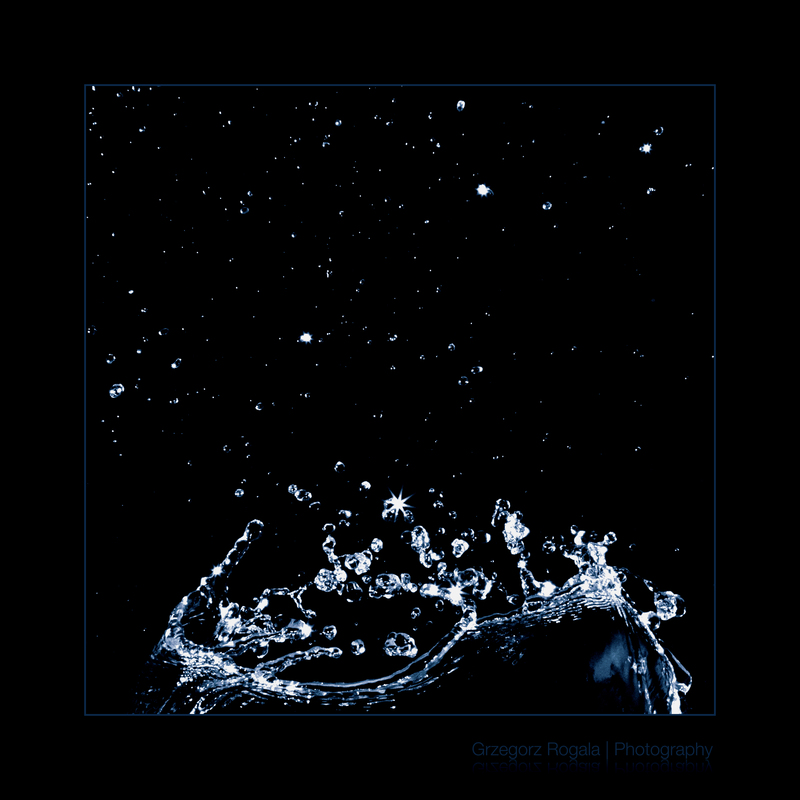 Drop the object into the water and press the shutter release button simultaneously. Most DSLRs are capable of shooting 4-6fps, so you will be able to get at least 4 exposures. As I said before, this is high-speed photography so you can’t really capture the desired and elusive moment yourself as it only lasts for a split second. That’s why it is best to use a TTL remote cord and shoot in High Burst Mode. If you want to give your pictures a little boost you will have to process them in some kind of picture editing software. I have used Adobe Lightroom 3 to increase clarity, sharpness and work on the curve as well as Photoshop CS5 to adjust Hue and Saturation and to slightly colorise the water. That’s it. Thank you for reading and I hope you enjoyed this post. Good luck with your photography. Also, make sure you watch one of Dom Bower’s video tutorial on Water droplets where Dom explains the whole setup in detail. Please see the ‘About‘ section for copyright information. This entry was posted on February 2, 2011 by Grzegorz Rogala. It was filed under Macro, Water Photography and was tagged with Creative Photography, Digital Photography, Droplets, Experimental Photography, Macro, Water.